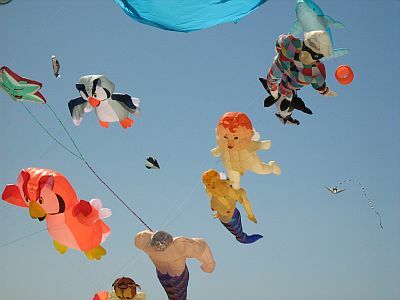 Colorful Kites - Best Photos From An International Kite Festival. There certainly were some very colorful kites on show at the last 3 kite festival events we attended. 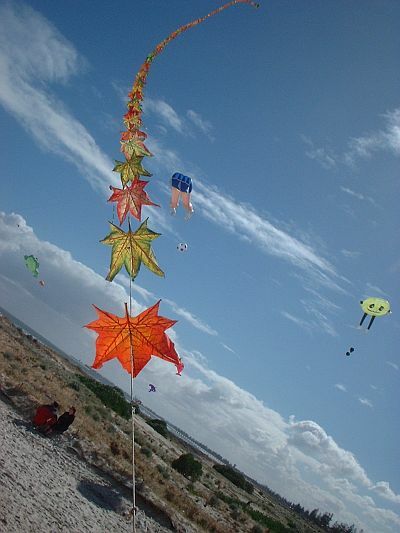 We took plenty of photos down at Semaphore Beach, South Australia, on these occasions. I have selected 8 of the most vivid examples to feature here. I've tried to dredge out some memories of the day as well, to liven up the captions a bit! This page is photo-heavy, so be patient. It might take a few moments before a whole bunch of colorful kites pop into view... Enjoy! 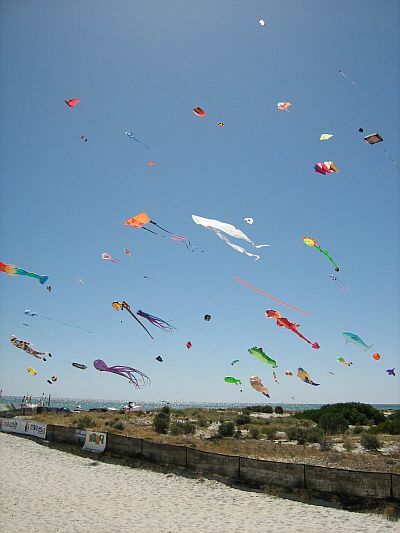 During the 2007 event in Adelaide, a Taiwanese kite master had been invited. 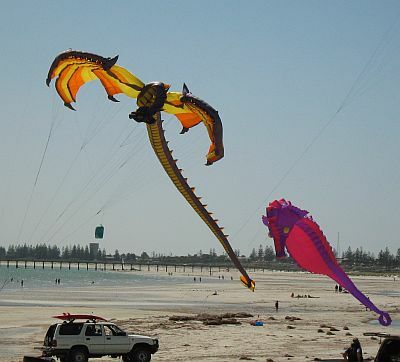 He and some helpers put up several magnificent kite trains. The one shown was leaning over at a 45 degree angle in a very fresh Southerly breeze. It stretched so far up that it was one of the very first things you noticed as you approached the beach. The flying line seemed to be made of traditional materials as well, and was quite thick in order to cope with the combined pull of all those colorful kites. This self-launching kite arch went up and down numerous times over a couple of days. 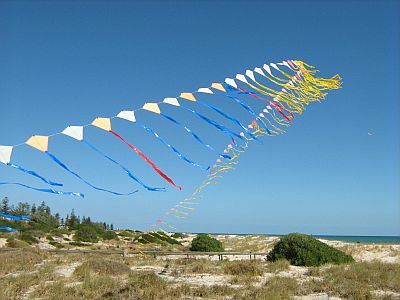 The small Diamond kites with colorful tails rested on the dunes near the entrance to the Semaphore jetty. When the wind strength was sufficient, the whole lot rose into the air with tails fluttering. Sometimes the arch was up for hours at a time. Here, I zoomed in on the most dense region of the 'kite cloud'. A riot of color, this shot features a number of inflatable kites. Also, a considerable amount of so-called line laundry, which are basically glorified wind-socks, anchored to the flying lines of bigger kites. Sure adds to the spectacle though! Two amazing inflatables here, particularly the dragon! I watched the dragon being launched, and snapped off 3 or 4 frames as it took shape in a moderate breeze. Possibly the longest kite I have ever seen at the Adelaide festival, not counting attached tails. It flew well, stable and upright all the time, and slowly writhing and shifting in the wind. The owner kept it on a short leash, close to the ground for maximum visual effect I suppose. With it's mixture of bright and dark hues, it was also one of the more colorful kites on show. Standing back a bit, I fitted as many kites as possible into this shot. Lots of detail here, if you look for it! There are inflatables, Deltas, Parafoils, Sleds and possibly a Rok or 2. Plus all the usual line laundry. Now for some photos from March 2009. This time we focused more on individual kites. Also, the festival as a whole was somewhat low-key since the winds were not so favorable. Much of the time, there was not enough wind strength to lift the more spectacular kites. 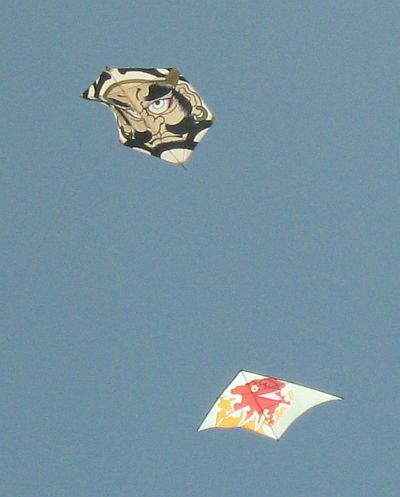 The photo above features a large Rokkaku with a striking Asian face design, and a large stylish Delta kite. 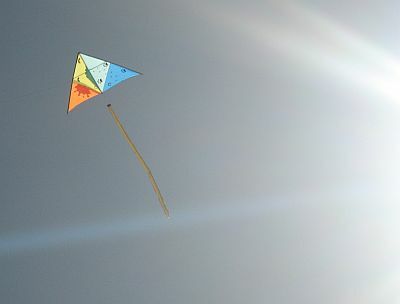 The Delta seems to be illustrated with a red dragon breathing yellow flames around the kite sail! Both colorful kites were flying quite high, so the camera's full zoom was required to get a good shot. Hence the image is a touch grainy. This large Sled was flying quite high too, so it's another zoom shot. Not your usual 2-stick Sled, this one has inflatable spars that provide some rigidity when rammed full of air during flight. 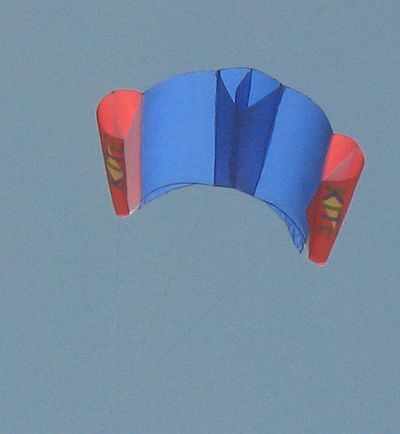 The simple but bright color scheme ensures the kite can be seen from a long way off. Finally, I just love getting some sun glare in the shot, as in this one. Slightly more interesting to look at than boring blue sky don't you think? The geometric colored panels of this Delta are lit up beautifully, with the sun shining through from behind.